I was hanging out at Kongregate this afternoon getting a look at their video game distribution service and community. 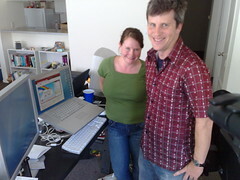 The two founders, a brother-and-sister team (Jim and Emily Greer) taught my camera a ton about the video game market. Kongregate caught my eye because of the very rapid growth it’s experiencing and because Jeff Clavier, one of the valley’s hottest early-stage investors, was ranting and raving about it when he came and visited me in line at the Apple store on Friday. In May 2007 they had about 300,000 unique visitors. A month later they had 750,000. Amazing growth so I wanted to see what was up with this hot company. Easy, they have two of the hottest games on the Internet: Desktop Tower Defense and the Fancy Pants Adventures. Several of my friends told me “DO NOT TRY THESE.” Why not? Because I’d get addicted and never blog again. Don’t just pay attention to the popular games, though, cause you’ll miss what’s really going on here. Kongregate is very close to going over 1,000 games. They were at about 990 this afternoon and are seeing 40 new games a week added to their site. How did they reach that milestone in less than a year? They provide a platform for games developers to distribute games and share in revenue. They also have a Facebook add-in. This reminded me of Electronic Arts’ Pogo.com, so I asked Jim about it (my brother-in-law who works on the Mac team at Apple is addicted to that site). Turns out Jim was one of the key guys on that site as well and left Pogo.com to start Kongregate. Of course you know where this conversation went, don’t you? Any guesses? What’s missing from a certain, um, mobile device released on Friday night? Steve Jobs, are you listening? Why don’t you buy these guys before they get too expensive? Make a platform where you could sell casual games to all of the iCult members? I know I’d pay $10 to play Tower Defense on my iPhone when I get it (still haven’t gotten one yet). I suspect I know why Apple hasn’t bought Kongregate yet: Apple is probably building a games distribution platform of its own into iTunes. I wouldn’t be surprised to hear Jobs announce that before the end of the year. The hole left by no games on the iPhone is just too big to be left there for long. But, for the rest of us we get to play some darn cool games thanks to Kongregate. Oh, don’t go there. You WILL get addicted. You’ve been warned. UPDATE: Louis Gray has a list of other addicting game sites. And more are coming, I just got invited to see another one coming soon. Very good stuff. I like the fact we Mac folk don’t have to wait 3 years to get some watered down port of the PC system that runs slower on our systems. Now, any old Web browser will do just fine! Meanwhile… I’ll go back to playing pinch hitter. Here’s a great iPhone game called iWhack where you get to “hammer home” the success of iPhone by whacking Steve Balmer (Microsoft CEO and iPhone critic) every time he pops up on the screen. I decided to quit smoking last week, but substituted one addictive thing for another. I wish I had never played that first game of Desktop Tower Defense! Seriously, it’s a great game. I think I spent at least 20 hours last week playing. Pingback: Addictive Online Games at Holy Shmoly! We have taken a different approach with pictogame.com anyone can create a game in 3 clicks. It’s working pretty well: we launched at the end of May and had over 20000 games (yes, twenty thousand games) created in just 3 weeks!